Viticulture is the process of growing the grapes that are used to make wine. Essentially anything that happens in the vineyard. Without quality grapes there can be no quality wine – no matter how good the winemaker is. So the art of viticulture is very important. On your Altitude wine tour you will visit three or four vineyards where you can wander around and have a look at the vineyards. Here are some of the things you can look out for on your journey. Most grapes are grown in the world between 30 and 50 degrees from the equator. This is where the climate is at it’s ideal. Grapes, like all fruit, are best when they ripen slowly – not fast. A minimum of 1500 hours of sunshine is normally required and some rain, approximately 700mm. If it is too hot and dry the grapes will ripen too quickly not developing any of the complexities needed to make good wine. Is Central Otago the perfect grape growing climate? Maybe so. 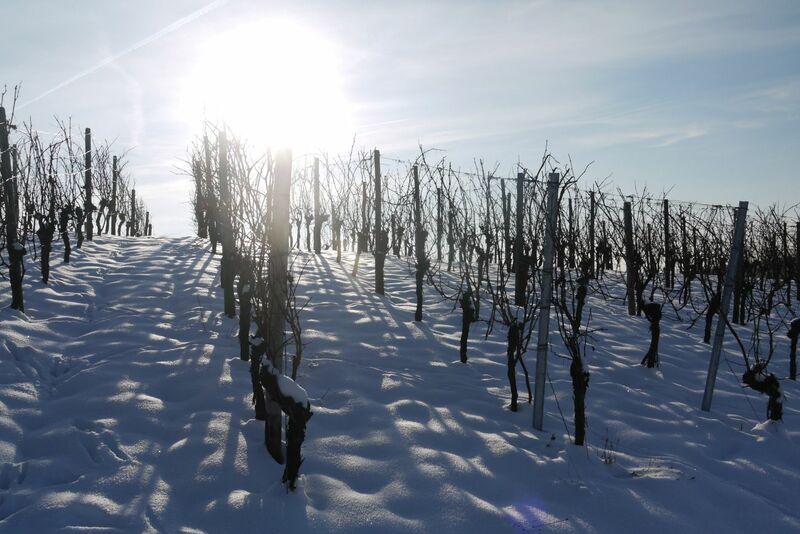 It has cold winters to let the vines rest and inhibit growth, with frosts which kill any disease (but not the vines), and rain and even some snow to build moisture reserves in the soil. The Spring is warm and mild with more rain to encourage vine growth and usually a warm settled period during flowering in October. The Central Otago summers are hot and sunny with very little rain and finally, most importantly, Central Otago has long dry autumns to ripen the grapes just before picking. So what could possible go wrong? Well if the frosts come late into Spring it can destroy the growing shoots or buds. In Autumn early frosts can destroy the ripe fruit as could hail, particularly in Central Otago where the preferred Pinot Noir grape is very thin skinned. There is also the wind. Central Otago is well know for it’s wind and too much can prevent pollination at flowering. Finally in Autumn too much rain at time of picking can cause the fruit to swell which dilutes the juice and make for weaker wine. While we talk about the climate of Central Otago generally it is in fact the case that each vineyard almost has it’s own climate – known as the micro-climates. Things like the slope and orientation of the vineyards, their proximity to bodies of water which mitigate the effects of frosts, regional winds, other vegetation and the types of soil that the grapes are grown in. In Gibbston valley while you on your wine tour you will see some vineyards are closer to the fast moving Kawarau River, some vineyards have protection from the wine for large pine trees or Mount Rosa, others drain differently because of the slope they are on. All these factors go into the viticulturist toolkit for growing great grapes. Believe it or not grapes produce the best wine when the vines are grown in poor/infertile soil with good drainage. The vines are forced to bury deep in search of water and nutrients. Deep in the soils the vines find greater trace elements and minerals which contribute to the flavour of the wine. If vines are too productive less effort is going into growing the grape and therefore less flavour. Generally it is said that chalky/limestone soils like around Marlborough are good for white wine and rocky granite or slate soils like around Central Otago are good for red wine. Perhaps the most complicated part of the viticultural process is the vines themselves. Wine is grown from a variety of grape called vitis vinifera. These are not the same grapes that we would find to eat in the supermarket. They are smaller and their juices more concentrated. Wineries use different clones which are created by mixing the cuttings of desirable grape stock. In the past there has also been grapes grown through cross-pollination such as Muller Thurgau which was a cross of the Riesling and Sylvaner. Generally wines made from cross-pollinated grapes are considered less quality than pure breeds. There is a twist to this story however. The European vitis vinifera vines are actually grafted onto American root stock known as vitis riparia due to a parasite that nearly destroyed all grapes worldwide. You can find out the full Phylloxera Story here. Once ready to become productive the viticulturist must decide on how they will grow their vines. Every year in winter vines are pruned to encourage growth and at the same time shaped. There are two predominant types of pruning: the spur; and the cane. The spur is a bush shape with two or three bud spurs. This is most common in hot environments like Spain, Southern France, and Rhone Valley where the grapes need leaves to protect them from the direct sunshine. The alternative cane (or guyot) system is the one you will see around Central Otago where there are two longer canes each with 8 to 12 buds. Each year they are pruned back to 2 new one year old canes and a spur for next year. During the season the grape growers must decide how many leaves to trim back to allow the sunshine into the grapes and also whether to green harvest some bunches. Green harvesting involves cutting off some bunches to limit the number of grapes per vine so that the vine puts more effort into it’s limited fruit creating more concentrated and richer juices. There is a French term “terrior” which is used to describe the mystical balance between the grape, the soil, the people and the micro-climate of the vineyard which work together to create the best wine.